These caves are under much of the Brushy Creek area near Austin. 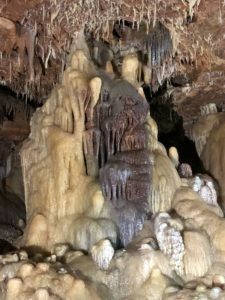 You can see how moist the formations are. Last weekend, I attended a conference for the Texas Master Naturalist group I’m a member of. While most of what I learned was more nature-oriented, one session I went to got me thinking a lot about our roles as renovators with respect to conserving water. 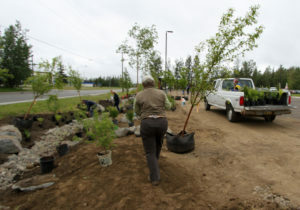 I realized that, if we are already going to be trying to make the landscaping at houses we renovate attractive, we could also help out the environment by making them water friendly. I’ve always been a fan of using native plants suited to the location of each house. But I hadn’t thought too much about using the landscape to help water act more naturally. If you live around the Austin area, or much of Texas, you will see the large detention/retention ponds near businesses. The idea behind these is that they will collect runoff from impervious parking areas and buildings, and collect them in a place where they can slowly filter into the aquifer, rather than running off into the drainage system, into creeks, into rivers, and out to sea. This is how the water cycle naturally goes, and I got a good reminder of it when I visited a cave recently. It was dripping from rains that had fallen days ago. This slow flow is how we refill the aquifers from which many of us get our drinking water. This is the best public domain rain garden image I found. 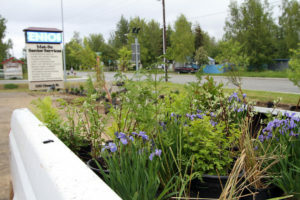 The presenter at our conference, Chris Maxwell-Gaines of Innovative Water Solutions, talked a lot about the use of rain gardens, which channel roof runoff into a depression in your yard, allowing it to slowly sink in, rather than running down the road to the culvert. What had never occurred to me at all was the technique of cutting into the curb of a house on a slope, and directing runoff into a curbside rain garden. You can water your “swale” (or whatever you call the area between the road and sidewalk) that way. They have lots of photos on their website. Oddly enough, Lee and I had been talking about an area in front of our house, where water insists on forming a little stream and settling. His attempts at filling it in haven’t worked, since the flow from our roof is so strong when it’s raining hard, like it’s been lately. We had the ideato make it into a dry stream, ending in a seasonal pond. Now we can work on making it a rain garden! I guess the plants will have to be dog friendly, but it sounds good. Rainwater is free, so why not use it to make houses look good for resale AND help the earth at the same time. Depending on the neighborhood we renovate in, we need to remember to consider other water-saving devices. For example, in Austin, watering your outside plants is often severely restricted. In addition to choosing to xeriscape or use drought-tolerant plants, we might consider adding rain barrels. Even small ones can help, and some of the large ones look pretty nice. In rural areas, collecting rainwater also makes sense, as many locations rely only on wells, which are becoming more and more unreliable these days. Having rainwater as a backup can make a property much more desirable. 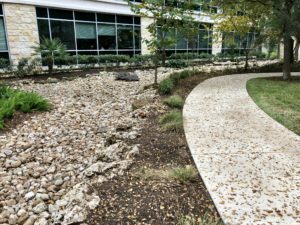 The dry stream in the courtyard at my Austin office building. It flows into a low area off to the left, but also diverts flood-level rain safely away from the buildings. I’m really inspired to include water conservation techniques in future renovations, when possible. Here’s a good article by Chris Maxwell-Gaines on the benefits of rainwater harvesting.